Statistical Harp is a sound installation by Coti & D. Charitos. It presents a statistical system that transforms data obtained by the sequencing of a literary text into sound, through carefully positioned speaker nodes distributed around the gallery. 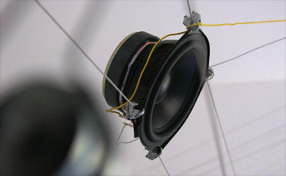 The resulting soundscape is constantly modified by the presence of audience members in the space. This installation was first presented at Cheap Art Gallery in Athens and since been presented at the State Museum of Contemporary Art in Thessaloniki. Coti K works as a record producer, musician and sound engineer in settings including solo record releases, film, theatre, dance, TV & installations. He has collaborated with many artists including Tuxedomoon, Blaine Reininger, Ilios & others. Dimitrios Charitos is a lecturer at the Faculty of Communication and Media Studies of the University of Athens. His artistic work involves electronic music, audiovisual, non-interactive or interactive, site-specific installations and virtual environments.